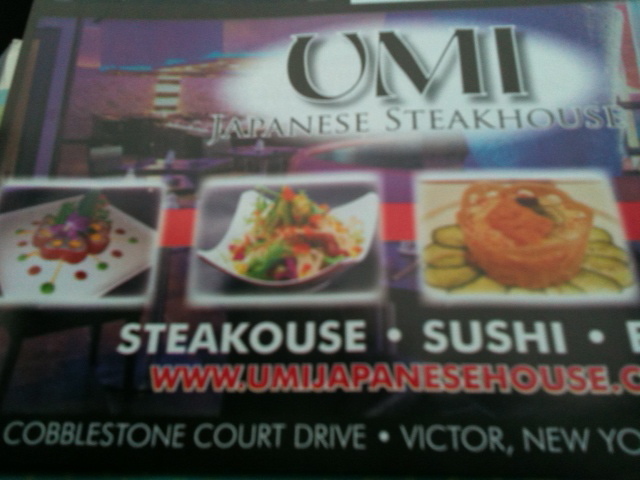 This flyer arrived in the mail today advertising a new, cool place to eat dinner. Yummy. Oopsie! Do you see it? Who can spot the error first? Who can leave me the funniest response? Ready? Go! This entry was posted in Grammar, Humor and tagged education, find the error, Food, Grammar, Humor, new restaurant in town, public relations, spelling counts, spelling errors, was this error intentional?. Bookmark the permalink. Missing H. Got it! I’ll stay with the baked salmon please. Ummmm…. Where did that H run off to???? Took a second read for me. Do we tend to correct without realizing? My daughter found a billboard last night that read something about dealing with dyslexia, and she swears a word was misspelled. Uh oh. I have never seen an Asian place that didn’t have a menu riddled with errors. That’s not trying to be racist, it’s just something I’ve noticed. It is what it is. There is some truth to this. Many of my fortune cookies have been redonkulous. 😉 But they were made in New Jersey. So what do you do with that? I think the facts are that after they bought the prints, and got them printed, they seen the misteak. A lot of people of course do correct things in their head when it’s on something that they or someone close to them didn’t write. When the written materiel is wrote by themselves or someone close to them, it’s a lot more personal and they take their time to read properly, other types of reading such as reading a sign is more of a quick glance, were our brain is on autocorrect mode. So after the company seen this, after they had got them printed, they had already spent the money on the prints and had an idea that people do auto correct spelling. Any advertisement is good as long as it’s not something that is really bad such as bad food. A simple spelling mistake and it not only got your attention but it got your attention so much that you posted on your blog about it and now other people know about the restaurant. It simply wouldn’t be worth purchasing the flyers from the printers, getting them back and realising the spelling mistake… Oops, then having to throw them all away. Waste of money, the mistake is not worth the cost of the flyers. I tinhk we atuo-crorcet all the tmie as we raed, jsut as our tnitxeg dvciees do, eplecilapy wehn wdors are seen in ctoxnet. I just had a Capitol Steps “Lirty Dies”: flashback. I would rather just eat at my own ouse. So you wanna go out to tat steakouse or wat? Leave it to you KB to bust me on my faux blog-break. Truthfully, I have one more week’s worth in the hopper and then the well is dry. Feel free to alert me to any photos you might procure of misspellings or other grammatical bloopers. Cuz I really am working on the book. Know what’s funny? While we’re wondering how they could possibly leave the H out many people wonder how we could possibly care. Or notice. I blame my mom. In my hometown, the Chinese restaurant sign invited you to eat in or tuke out for years before it eventually was replaced! So whatever did you do?